Timeless, elegant and understated –Meghan wore an iconic wedding dress with a bateau neckline and five metre-long silk tulle veil with embroidered flowers in silk threads and organza. The royal bridal gown was designed by British designer Clare Waight Keller, the first female artistic director of the historic French fashion house Givenchy. Throughout the wedding, Meghan Markle and Prince Harry infused their own personalities and beliefs alongside centuries of royal traditions, to symbolise a new royal era and their relationship. The bridal dress was no different, created by a strong female figure in the fashion world who represents British talent, the design was made to compliment the modern princess and also maintain a timeless elegance. The neckline gracefully framed the shoulders and emphasised the bride’s sculpted waist, as Givenchy’s impeccable style of tailoring was highlighted. The train flowed in round folds with a subtle cushioned underskirt in triple silk organza. As the slim three-quarter sleeves exuded sophistication and refined modernity. The shoes were styled in a classic Givenchy point, as the couture designed shoes were made of silk duchesse satin –fit for a Duchess, of course! 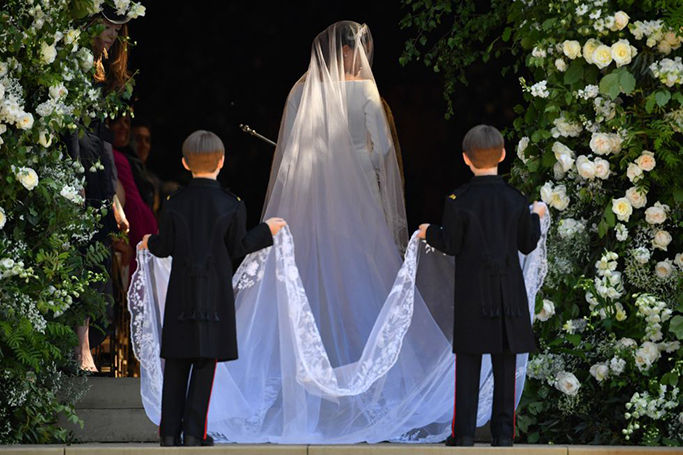 Meanwhile, the veil was designed to signify the flowers of each Commonwealth country united in one special composition, as Meghan Markle worked closely with fashion designer Clare Waight Keller to produce the meaningful veil. As the long silk tulle veil was definitely the bride’s show stopping fashion feature! The Veil was held in place by a bejewelled diamond bandeau tiara which belonged to Queen Mary; lent to Markle by Queen Elizabeth, it was the perfect “something borrowed” for the bride. The Duchess of Sussex finished her bridal look with a Cartier bracelet and earrings. Whether you were wowed or underwhelmed with the royal bride’s wedding dress –you can’t deny the new Duchess of Sussex looked stunning, as Prince Harry sweetly said “I’m so lucky” when his bride met him at the aisle…awwww!